Whilst walking through the expansive Wyoming wilderness of Firewatch I couldn't help but feel alone and reflect on the breadcrumbs of the emotionally charged story that I continued to find and follow, all the while keeping my head on a swivel because of a fog of dread that just wouldn't clear. After being given a short backstory to your character Henry through a series of text based choices you’re dropped into the wilderness to make your way to the watch tower which will become you're home for the remainder of Firewatch. Once there you are greeted by the voice of your supervisor Delilah as she speaks to you through a walkie talkie, this voice will from this point forward be your only companion for the remainder of your journey. As you go about your duties as a member of the Firewatch team you are given limited dialogue options with Delilah as you both go about getting to know each other and the job that lays ahead of you. As you begin to develop an understanding of who these characters are you begin to realise they are both flawed in their own particular ways which creates an interesting dynamic in their conversations and relationship. 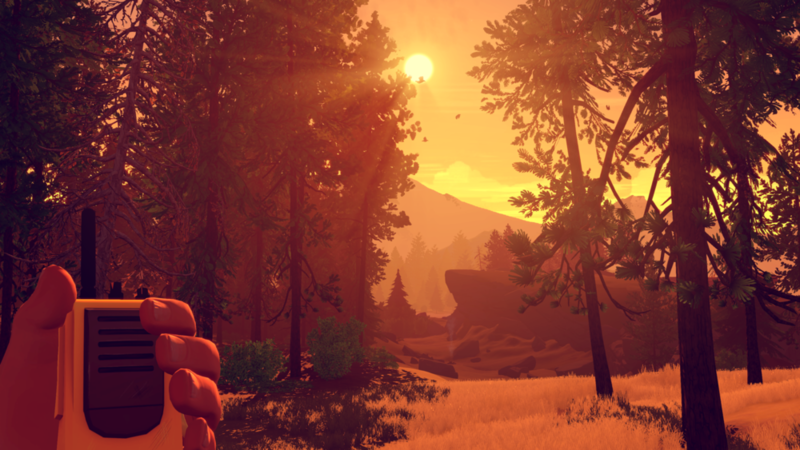 As the depth of your relationship grows it goes through many different fazes and levels of trust and mistrust all the while contributing to the overarching story and mystery of Firewatch. While the days continue to tick away you begin to venture further and further away from your tower each day and this is where the richness of this world begins to take shape as you discover little clues to the past and get to know Delilah on a more personal level. The entire time you are hiking around the environment searching for the next clue to solving the mystery or simply chatting away to Delilah there always seems to be a cloud of fear that hangs over your head as you half expect something to jump out at you at any moment. This is where the writing in Firewatch really begins to shine as it plays with this feeling using it to make jokes and play with your emotions as your imagination builds its own story in your head. The voice acting by Rich Sommer (Henry) and Cissy Jones (Delilah) is phenomenal throughout as you can truely feel their emotions without ever seeing their faces. Through your choices in the dialogue sequences you as the player has the opportunity to shape the relationship between Henry and Delilah in two main ways, you can choose to be very close on a romantic level or you can choose to be distant and somewhat combative, which is then highlighted in the voice performances. Graphically the game has a beautiful art style which captures the wilderness well without being photo realistic, which I feel helped because I was never looking at it trying to find faults. The level design and the way the story has you travers the map allows you build up a memory of the area which you can then use to direct yourself around without using the map, which is a good thing because it is implemented into the control scheme in a rather clunky way. When playing on the Playstation 4 I encountered drops in frame rate and pop-in of textures that tended to break my immersion but thankfully because the story was so compelling I was quickly drawn back in to focuse on getting to the next breadcrumb of the story. I did however encounter one game breaking bug that required me to reload my last save as the game didn't register when I had left a certain area to trigger the next step in the story. One drawback of having such a compelling story with a game like this is you can become so enraptured with getting to that next piece of the puzzle that you may not take the time to explore off the beaten path. It would have been nice to maybe be given a day here or there where you didn't have a story task to complete so that you you could explore the wilderness more. Sadly while the payoff at the end of Firewatch falls a touch flat following such a strong beginning I would still certainly recommend you play this game. 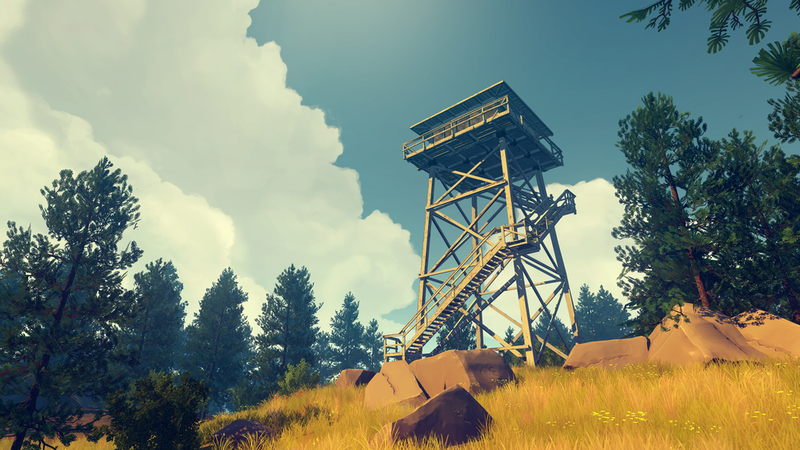 Firewatch could even be used to introduce someone in your life that doesn't regularly play video games to the medium as it is very story driven and will certainly capture their attention much like a good movie does.